Hong Kong is the world's greatest all around dining and shopping paradise. Few seasoned travelers would argue with that statement. Hong Kong has roughly 10,000 restaurants. It would take you 27 years eating out every night to dine in all of them. One of Hong Kong's most modern and upscale dining areas. Their fishing villages have harbor side seafood restaurants. Many are touristy, but some are worthy of Hong Kong gourmets. Known for its trendy international restaurants and bars. Attracts the young modish set. Home to two gigantic floating restaurants. Popular with tour groups and wedding parties. Food is substandard. The number one cuisine of Hong Kong is Cantonese, though you can easily find restaurants specializing in China's other major regional cuisines including those of Shanghai and Sichuan. 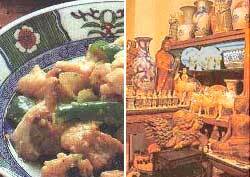 Click the "Chinese Cuisine" link at the bottom of this page for my descriptions.